Last week, when I wrote about how to become a writer, I forgot to mention something about why you’d want to be a writer. Writers are communicators. If you’re proud of your ideas, you want to be able to communicate them clearly and precisely. Headlines are your first opportunity to present your message to the audience you want to reach. The language you use should appeal to those people and make them want to find out more. To review the next headline you write from the perspective of an editor who is focused on audience engagement, here are three simple questions you can ask yourself. The answers to these questions most likely won’t produce the exact headline you’ll use. Rather, they’ll help mold your headline draft into a persuasive message that reaches and connects with the people you want to attract to your content. 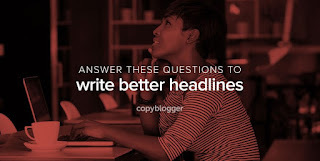 To keep the process of infusing your headline with meaning and fascination simple, I recommend answering each question in one to two sentences. If you need to write more, recognize your opportunity to fine-tune your goal for the content before revisiting these headline questions. Let’s look at the important information each question will help you cultivate and how the answers will transform your headline. 1. Who will benefit from this content? When you define your audience, you can review your headline to make sure you use language that intrigues those individuals. For example, your target audience may be marine biologists who have a tendency to procrastinate. 2. How do I help them? People don’t necessarily wake up in the morning excited to read content. The promises that certain pieces of content make to expand people’s understanding or knowledge of a topic persuade them to read content throughout the day. The content may even change their lives. Your tips might help marine biologists accomplish tasks faster, and if they can accomplish tasks faster, they’re less likely to put them off. 3. What makes this content special? You may now realize that while a lot of other articles focus on “beating procrastination,” your content is special because it shows how to simplify and organize your daily marine biology to-do list so that each task is manageable. If you’re a marine biologist with a tendency to procrastinate, which headline would you click on?